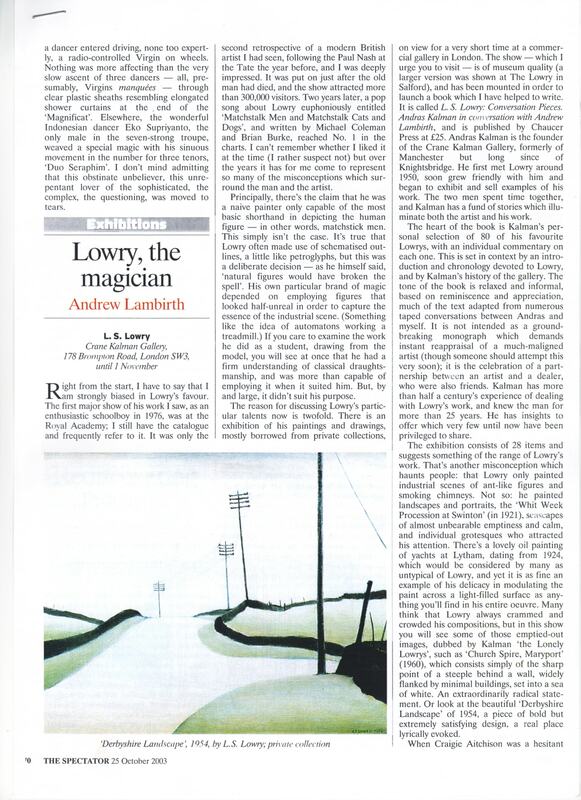 Right from the start, I have to say that I am strongly biased in Lowry's favour. The first major show of his work I saw, as an enthusiastic schoolboy in 1976, was at the Royal Academy; I still have the catalogue and frequently refer to it. It was only the second retrospective of a modern British artist I had seen, following the Paul Nash at the Tate the year before, and I was deeply impressed. It was put on just after the old man had died, and the show attracted more than 300,000 visitors. Two years later, a pop song about Lowry euphoniously entitled `Matchstalk Men and Matchstalk Cats and Dogs', and written by Michael Coleman and Brian Burke, reached No. 1 in the charts. I can't remember whether I liked it at the time (I rather suspect not) but over the years it has for me come to represent so many of the misconceptions which surround the man and the artist. Principally, there's the claim that he was a naive painter only capable of the most basic shorthand in depicting the human figure - in other words, matchstick men. This simply isn't the case. It's true that Lowry often made use of schematised outlines, a little like petroglyphs, but this was a deliberate decision as he himself said, 'natural figures would have broken the spell'. His own particular brand of magic depended on employing figures that looked half-unreal in order to capture the essence of the industrial scene. (Something like the idea of automatons working a treadmill.) If you care to examine the work he did as a student, drawing from the model, you will see at once that he had a firm understanding of classical draughtsmanship, and was more than capable of employing it when it suited him. But, by and large, it didn't suit his purpose. The reason for discussing Lowry's particular talents now is twofold. There is an exhibition of his paintings and drawings, mostly borrowed from private collections, on view for a very short time at a commercial gallery in London, the show (which I urge you to visit) is of museum quality (a larger version was shown at The Lowry in Salford), and has been mounted in order to launch a book which I have helped to write. It is called L. S. Lowry: Conversation Pieces. 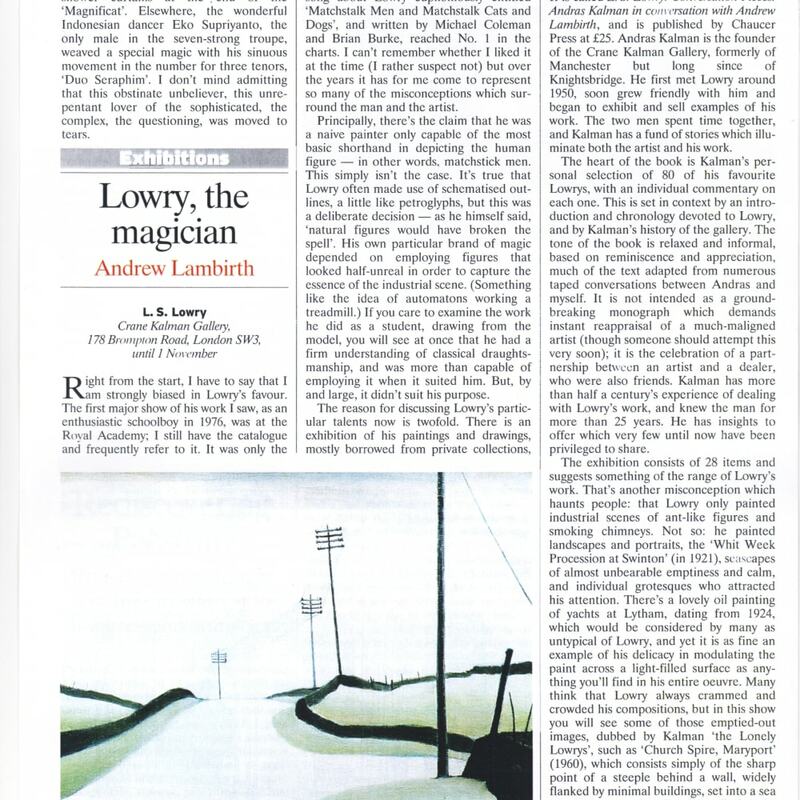 Andras Kalman in conversation with Andrew Lambirth, and is published by Chaucer Press at £25. Andras Kalman is the founder of the Crane Kalman Gallery, formerly of Manchester but long since of Knightsbridge. He first met Lowry around 1950, soon grew friendly with him and began to exhibit and sell examples of his work. The two men spent time together, and Kalman has a fund of stories which illuminate both the artist and his work. The heart of the book is Kalman's personal selection of 80 of his favourite Lowrys, with an individual commentary on each one. This is set in context by an introduction and chronology devoted to Lowry, and by Kalman's history of the gallery. The tone of the book is relaxed and informal, based on reminiscence and appreciation, much of the text adapted from numerous taped conversations between Andras and myself. It is not intended as a ground-breaking monograph which demands instant reappraisal of a much-maligned artist (though someone should attempt this very soon): it is the celebration of a partnership between an artist and a dealer, who were also friends. Kalman has more than half a century's experience of dealing with Lowry's work, and knew the man for more than 25 years. He has insights to offer which very few until now have been privileged to share. The exhibition consists of 28 items and suggests something of the range of Lowry's work. That's another misconception which haunts people: that Lowry only painted industrial scenes of ant-like figures and smoking chimneys. Not so: he painted landscapes and portraits, the 'Whit Week Procession at Swinton' (in 1921), seascapes of almost unbearable emptiness and calm, and individual grotesques who attracted his attention. There's a lovely oil painting of yachts at Lytham, dating from 1924, which would be considered by many as untypical of Lowry, and yet it is as fine an example of his delicacy in modulating the paint across a light-filled surface as anything you'll find in his entire oeuvre. Many think that Lowry always crammed and crowded his compositions, but in this show you will see some of those emptied-out images, dubbed by Kalman 'the Lonely Lowrys', such as 'Church Spire, Marwore (1960), which consists simply of the sharp point of a steeple behind a wall, widely flanked by minimal buildings, set into a sea of white. An extraordinarily radical statement. Or look at the beautiful 'Derbyshire Landscape' of 1954, a piece of bold but extremely satisfying design, a real place lyrically evoked. All rights - The Spectator.